Sometimes when you’re exploring other planets or strange realms, your best friend really is a warm gun. Sometimes, your wits and your fists aren’t enough, and you need to defend yourself… with a pistol. We weren’t really sure whether to include this one, but it got by far the most votes in our Facebook poll. 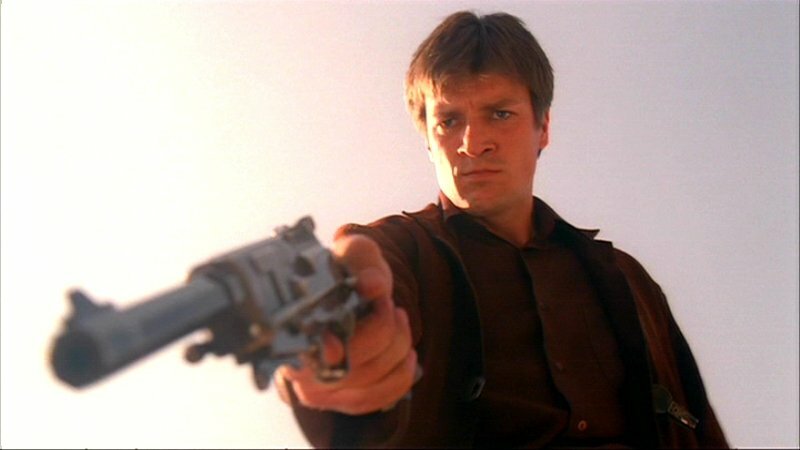 (There’s just something about Browncoats and polls.) And you have to admit, it is a gorgeous piece of ordnance. According to this super-detailed gun-related website, it’s an antique-styled weapon, but judging from the sound effect, it uses some unknown futuristic propellant. Like everything on Firefly, it’s retro but also futuristic. By all accounts this gun shoots explosive shells, meaning it makes quite a mess if Deckard decides he didn’t like your responses to those turtle questions. And it’s a big scary gun, with some rifle characteristics as well as bits of a basic .44. It’s got intimidation as well as blasting power. Halo may have made the Needler gun famous, but Harry Harrison’s hero, the Stainless Steel Rat, was shooting them first. In the Harrison books, the Needler gun could shoot all sorts of different needles, including paralyzing needles, truth serum, nerve toxins and so on. In Halo, the Needler shoots needles that track your opponents, and it can shoot at a very fast rate. If you embed seven needles in a player in the same area, they explode and kill the player. Image via Kotaku. We have to give some props to a gun that can kill almost anything. It’s the ultimate magic gun! Made by gun-maker Samuel Colt (whom we met last week), this gun is enchanted with such powerful spells, it can kill even the most powerful demons and beasties. There’s only a few supernatural creatures whom the gun won’t work on… including one of the most important evildoers in the Supernatural mythos. Still, it’s a great plot device and an awesome object for your mystical gun fetishism. Sometime during season 2 of Farscape, John Crichton starts calling his trusty phase pistol Winona, and she’s his constant companion through thick and thin — even if she does jam occasionally. She’s a nice sleek automatic pulse pistol, and she’s quite possibly the only gun named after Winona Ryder. She becomes a big enough part of Farscape mythology that the Farscape PC game devotes some time to explaining how Crichton got her. Agent J learns what Yoda could have told him — you shouldn’t judge by size. Agent K gives Agent J a tiny gun — which sends him flying backwards every single damn time he tries to shoot it. And it tends to make anything he aims it at explode. Hence the name. Because Han Solo couldn’t have shot first if he didn’t have an awesome gun at his side. As with everything else in Star Wars, there are absurd amounts of info about the DL-44 on the internet. It has great accuracy and yet packs a heavy punch — and the ability to pack a bolt twice as powerful without damaging the sidearm. And it includes galven circuitry (whatever that is) which allows it to inflict more damage with a normal drain rate. Speaking of magic guns… According to the Hellboy comics, “The gun itself has unearthly resistance to almost all forms of attack, and includes grips carved from fragments of the True Cross. The metal of the gun is forged from a combination of Irish church bells, cold iron from crucifixes, blessed silver, and other mystic metals.” It’s basically the total package in terms of magically enhanced armaments. Of course, Hellboy gets an even bigger gun in Hellboy II, called The Big Baby. We pretty much had to include this one. 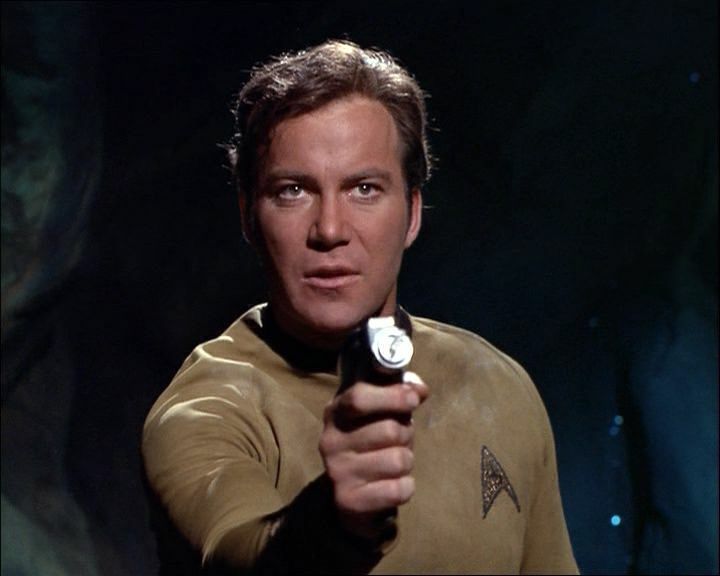 Whether it has a traditional handgun shape or a weird cellphone shape, the phaser is a totally awesome weapon. It can stun, kill or disintegrate. And if you’re stuck on a frozen ice planet, it can heat up rocks for you. You can even set a phaser to self-destruct and turn it into a bomb that’ll go off in an undefined period of time. Our love affair with this gun wasn’t only a phase — it was for always. Next story Briefs: Idina Menzel Returns to Broadway, “The Suburban Strange,” and Neil Patrick Harris Addresses Rumors.